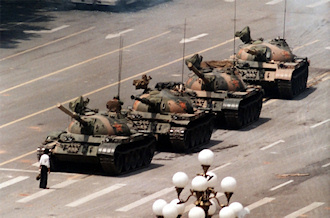 It’s the 24th anniversary of Tiananmen Square. I was a student in 1989. I was backpacking in Europe when it happened. I was overwhelmed with a sense of guilt and fear and sadness. The image of the student standing in front of the tank haunts and inspires me still. We are so lucky. To express our opinions and ask for recourse, to ask for or demand what we think is rightfully ours. It doesn’t make us bitchy. It makes us free. It’s a privilege. One we cannot take for granted or discard as too complicated or too demanding. One we must cherish.